AT SOME points even cinema legends have to draw a close to a significant chapter of their careers. 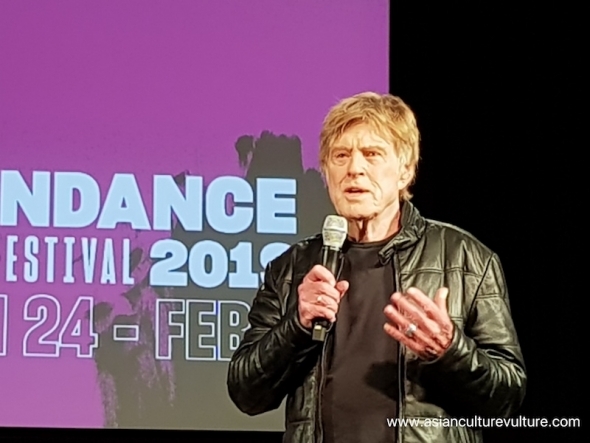 And so it seemed when Robert Redford (pictured above), the screen actor and director, who created the Sundance Film Festival (January 24-February 3) seemed to indicate he wouldn’t be returning in quite the same capacity next year or any other year after this. He said he wanted to return his original passion and purpose of creating this unique festival – dedicated to independent filmmaking – to get back to the films and the filmmakers themselves – and perhaps be less caught up with hoopla of creating, organising and fronting a festival. He told the gathered press at the Egyptian Theatre in Park City, he had been welcoming them to the festival for 34 years and hinted this would be his last such address, speaking only for a few minutes and then departing. broad themes and choices and answered a few pre-conference submitted questions. Away from Redford’s statement of intent, a Julianne Moore movie, ‘After the Wedding‘ took centre stage and she was here among other members of the cast and director Bart Freundlich. As well as attending the press conference acv saw two films – ‘The Inventor: Out for blood in Silicon Valley’, about the Elizabeth Holmes story; and ‘Native Son’ a narrative feature set in Chicago and covering a young black man’s journey from ghetto to luxury and a very different life as a driver to a stupendously rich family.